Pope Francis has deconstructed the narrative on his own pontificate. In the view of the news media (especially the secular media), Pope Francis’ election opened a new season in the life of the Church. Under Pope Francis, the Church reportedly started to combat corruption, to tackle scandals and to live in poverty as the Gospel mandates. Until now just a few people, basing their conclusions on data and not on ideologies, tried to show that Pope Francis was simply following the outlines for reform that were in place before his pontificate. Now the Pope has eliminated any doubt. 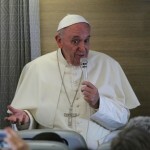 During the usual press conference on the flight back to Rome from the Central African Republic, Pope Francis was asked about the second Vatileaks and the trial taking place right now in the Vatican. His response went beyond his thoughts about the people currently on trial in the Vatican, all the way back to the 2005 Conclave. In Pope Francis’ words “thirteen days before the death of St. John Paul II, during the Stations of the Cross (the usual Stations of the Cross at the Colosseum: editor’s note), the then Cardinal Ratzinger who led the Stations devotion spoke about the filth in the Church. He was the very first to denounce it! Then, after the death of Pope John Paul II, during the Mass “pro eligendo pontifice”, Ratzinger (who presided at the Mass since he was Dean of the College of Cardinals) mentioned the same thing once again. We elected him because of his openness about these issues.” Ever since, Pope Francis added, corruption became a topic within the Vatican walls. In the end, it was Pope Francis himself who did justice to the work of his predecessor. Pope Benedict had set the basis for a structural reform which not only involved the Roman Curia, but the overall Vatican apparatus. The financial reform is the one most often mentioned: during the upcoming week, the Vatican will present its second progress report to the Council of Europe’s MONEYVAL Committee. However, Benedict XVI prepared and carried forward many other reforms. For instance, he started the reform of charitable organizations, issuing new statutes for Caritas Internationalis and the motu proprio on diocesan-based charities. Benedict XVI also undertook a huge project in updating the Vatican Penal Code, a reform that Pope Francis capped off on July 13, 2013. Benedict XVI also pushed for a Church less moralistic and worldly: appeals of this sort are found in several of his speeches, and in particular those delivered during his trip to Germany in September 2011. Why, then, was Benedict XVI’s pontificate considered as a mere parenthesis in the history of the Church? During the 2013 pre-Conclave meetings, many Cardinals spoke about the need to carry forward reforms. In fact, Cardinals who asked for a reform in continuity with the preceding ones were sidelined within the Conclave. According to some sources – who spoke in vague terms, since there is a pontifical secret covering the pre-Conclave meetings – some of the Cardinals were not even given the floor. A glance at the schedule of the pre-Conclave meetings shows how Cardinal Angelo Sodano, Dean of the College of Cardinals, managed the works. After Benedict announced his resignation, there was pressure to move up the opening date of the Conclave. Benedict was pushed to change the Apostolic Constitution “Universi Dominici Gregis,” that regulates the conclave. He issued a “motu proprio” to clarify that pre-Conclave meetings could start in advance. Two half days were taken away from the general discussions among Cardinals. One half-day was dedicated to a celebration in St. Peter’s Basilica, and another half-day at the end of the General Congregations was carved out from discussions when the Dean scheduled a free afternoon. When Cardinal Sodano made this proposal, and then made the decision, not all the Cardinals had yet spoken. One of the Cardinals who has now an important role in Pope Francis’ reform made this fact public, and other Cardinals discreetly sent letters to the new Pope after the Conclave explaining what they would have said if they had had a chance. They wrote about problems of government and management; in general, about Curia reform. But speaking in terms of “Curia reform” is not fully correct, as this terminology does not include some departments. It does not include, for example, the Vatican City State Administration which issues a separate balance sheet. It does not include the media department, and in fact each branch of the media department works with its own balance sheet. It does not even include the Institute for the Works of Religion (otherwise known as the IOR or the so-called Vatican Bank): only recently its employees were counted among the ranks (on a par with) the employees of the Roman Curia. The decision was made by Pope Francis via a rescript dated November 26, 2013, later published in the “Communicationes” of the Pontifical Council for Legislative Texts. This rescript has not been publicized much. Looking backward with today’s knowledge, it becomes clear that in order to achieve his goals, Pope Francis had to carry forward reforms rapidly. A blitz was needed, and not a continuation of discussions, in order to carry on the reforms whose basis had already been set by the previous pontificate. Not by chance, when he announced his resignation, Benedict XVI left clear indications of the reasons. He said that his advanced age did not permit him to fulfill to his Petrine ministry. That is: we need a younger person, with a wide perspective, a lot of energy and great knowledge of things to carry forward this reform project. During the 2013 General Congregations preceding the Conclave, nothing went as hoped. In order to fully understand what the climate was, it is important to re-read the articles written by journalists who later conducted book interviews with Pope Francis, analyze where the information concerning the discussions at the pre-Conclave meetings came from, and take note of how the information was managed in order to understand that everything was managed to make it appear that the election of Bergoglio represented a break with the previous pontificate. This campaign was orchestrated in order to support and elect a pope with huge popularity, but with poor knowledge of the Curia. Looking now at how reforms have been slowed down by the same individuals who promoted the “revolution,” we can conclude that they have succeeded. Pope Francis collected the suggestions of the pre-Conclave meetings. Soon thereafter he established a Council of Cardinals to assist him, and after that the two Pontifical Commissions of Reference, the COSEA for the economic and administrative structure and the CRIOR for the Institute for the Works of Religion. The COSEA hired external consultants whose proposals and evaluation could not be fully accepted because they viewed the Vatican mostly as a company, and not as a sovereign State. Step by step Pope Francis has become acquainted with the issues at stake, mostly thanks to his political instinct. In the end he did not shut down the Institute for the Works of Religion, and Curia reform is seemingly stalled. The reform ought to have been functional, more than structural. Rather than changing the names of the dicasteries, or rolling more of the smaller dicasteries into larger congregations, curial dicasteries needed to be made more efficient, their overall administration should have been rationalized, and all of the organs of the Church’s central management needed a common vision. To achieve these goals, everything should have been done quickly, via “motu propri”. As time passed, the small gangs that successfully resisted Pope Benedict reorganized in order to hold on to their power. With one rescript after another, these small gangs have by now succeeded in re-establishing the status quo. Their last success was a letter the Pope sent to Cardinal Pietro Parolin, Secretary of State, which establishes that until the Curia reform is complete, everything will keep on working as it has been. So at the moment, Pope Francis’ reforms are stalled, while the Pope is seemingly left alone. In the meantime, the Vatican is once again under attack, and it defends its sovereignty by bringing criminal charges against those who leaked confidential documents, as any State in the world would do. The importance of the Holy See’s sovereignty is often undervalued by the very members of the Curia who are carrying forward the reforms. After almost three years of this pontificate, Pope Francis should have understood the terms of the war against the Church. This war has had several fronts. First, there were attacks on the Church as a diplomatic force (in the mid-90s there was a very strong campaign to diminish the rank of the Holy See at the United Nations, from Observer State to NGO); after that, there was an attack on the Church as a moral force (the pedophilia scandals); and finally, there have been attacks on the means that the Church uses to carry on its mission (Vatican finances, which were the target of the leaks contained in books published in 2009, 2012 and 2015). At the same time, there is also another, more subtle, anti-Church war going on. It is a symbolic war. With a Pope who made “a poor Church for the poor” his motto, secular forces are trying to make the Church weak. The common good and all men’s equality in dignity have always been the Church’s final goal. The Church wants to see all people treated on a par, to eliminate the imbalances that lead to unjustice. A poor Church for the poor cannot accomplish this. If it wears poor clothes, it is then closed off with the poor. If it adopts the point of view the poor, it remains with them in a ghetto, while decisions on its fate are made by the most powerful. This is a symbolic fight that has yet to be understood. We can glimpse some of it in the secular media, which amplifies Pope Francis when he speaks about a poor Church, and mutes him when he proclaims the message of the Church clearly and loudly. Pope Francis’ real enemies are probably his closest friends. 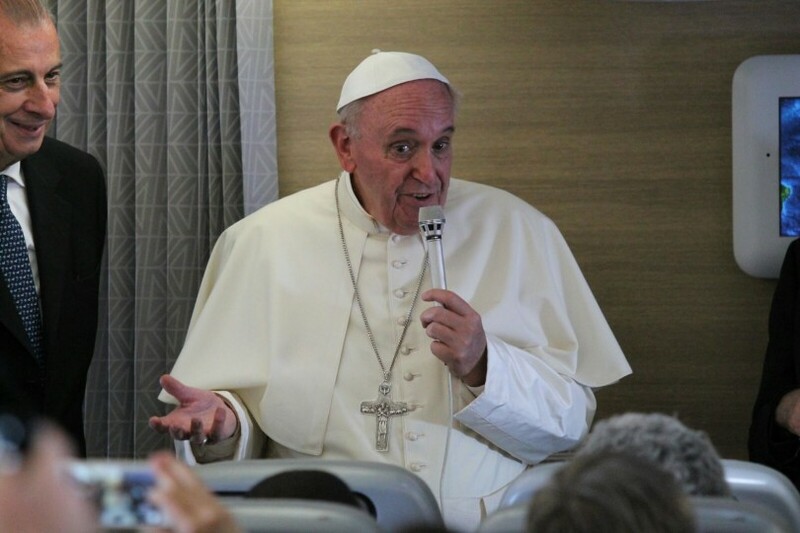 Yet, during his last press conference on the flight back from Africa, he acknowledged the importance of Benedict XVI’s pontificate. It is rumored in the Vatican that Pope Francis still asks the Pope Emeritus for recommendations and opinions. Benedict XVI climbed the mountain to pray and intercede for the Church, and from there he acts as a spiritual support for those who look for him to pray with them. He is sustaining the Church with prayer. It is this moral power who remains within the Vatican, which is Pope Francis’ true hidden adviser. The fact the Pope emeritus will be at the opening of the Holy Door in St. Peter Dec. 8 proves that his presence is still important for the Church. I am reading you always with much attention and great profit. Thanks. Making it appear as if one can deny that God Is The Author of Love, of Life, and of Marriage, and remain in communion, is consistent with Pantheism, not Catholicism.